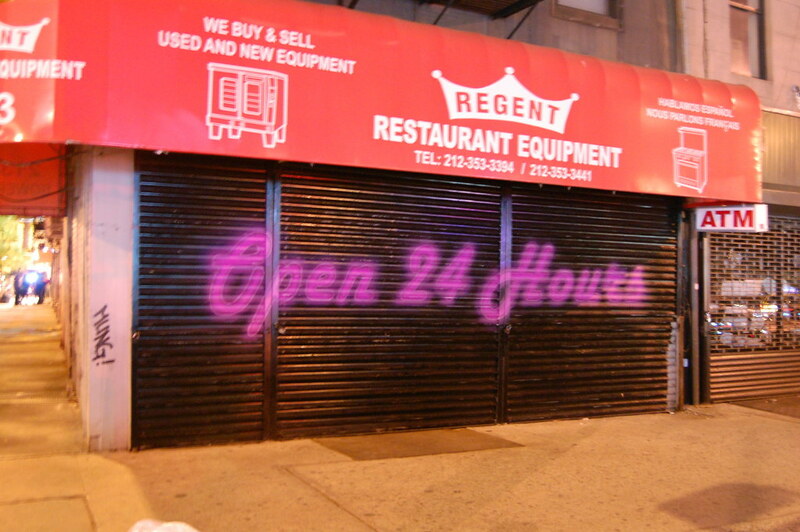 In December 2009, the New York City Council voted to require business owners to replace garage-style security gates with ones that allow views into the stores behind them by July 2026. "Roll-down gates are essentially large metal canvases," the New York Times' James Barron wrote in a report on artists who criticized the ban on the metal walls (which can no longer be installed after July 1 of this year). Barron noted that some painters have made their names on those gates, like octogenarian Franco Gaskin (also known as Franco the Great or the Harlem Picasso), who has painted scores of them around the world and more than a dozen along 125th Street in Manhattan. 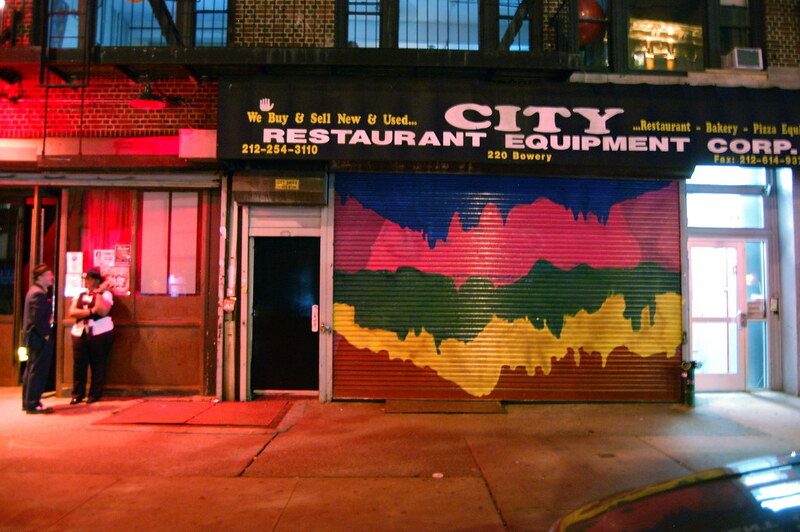 In other cases, a street-level mural may be one of the highlights of an artist's career. The city is filled with them. 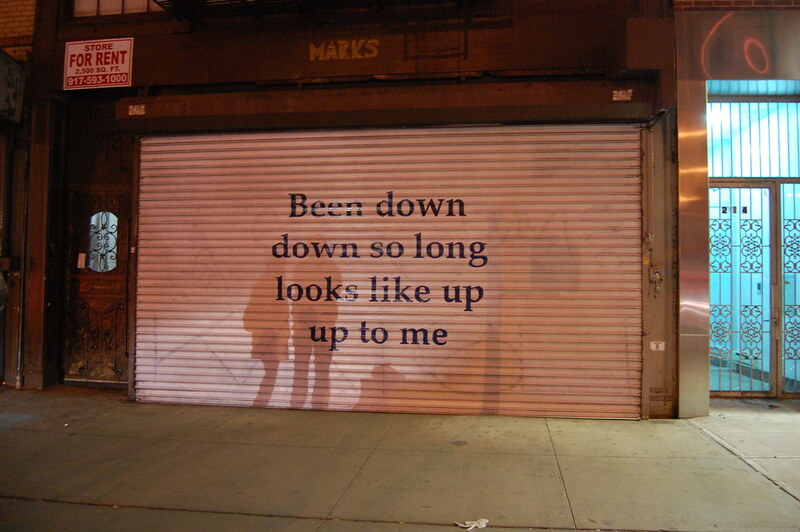 All of which is to say that the Art Production Fund's latest project, which involved commissioning contemporary artists to design murals for 18 security gates along the Bowery, between Houston and Grand Streets, has an elegiac element alongside its more celebratory aspects. 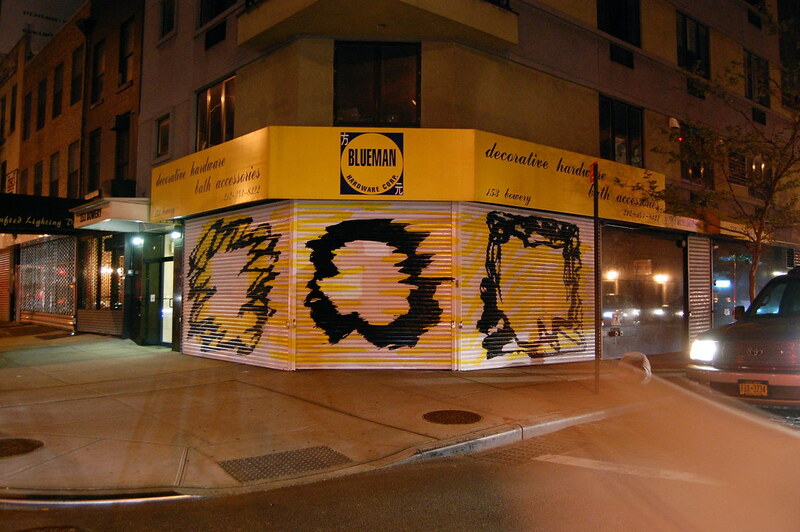 The works, which officially debuted on the evening of May 7 (they're only visible when the stores are closed: at night and on Sunday, in most cases), are on view for only two months, after which they'll be painted over, embodying the upcoming legislated disappearance of the gates across the city. A medium is slowly being ushered offstage. At a time when street art by its most famous practitioners is sometimes sliced off of buildings and sold, I'm a little surprised that no one has proposed auctioning off the soon-to-be-defunct gates to raise money for the APF or the nearby New Museum, especially since some of the works are really wonderful. Three of the most interesting are the abstract works by Mary Heilmann and Jacqueline Humphries and a characteristically manic, brushy text piece by Judith Bernstein, which could all be mistaken for the graffiti that appears on almost every other gate in the neighborhood. They appear to have been quickly and roughly painted, like many of the tags on the surrounding gates, and their work slips easily into the visual landscape of that stretch of blocks. Of course, the murals were in fact meticulously executed by teams of artists working from blueprints. They possess what art historian Rosalind Krauss, discussing Impressionist painting, calls the "codified sign or seme of spontaneity." They look easy, but they're hard-won: painting with the speed of a graffiti artist is difficult work. A tricolor triptych! 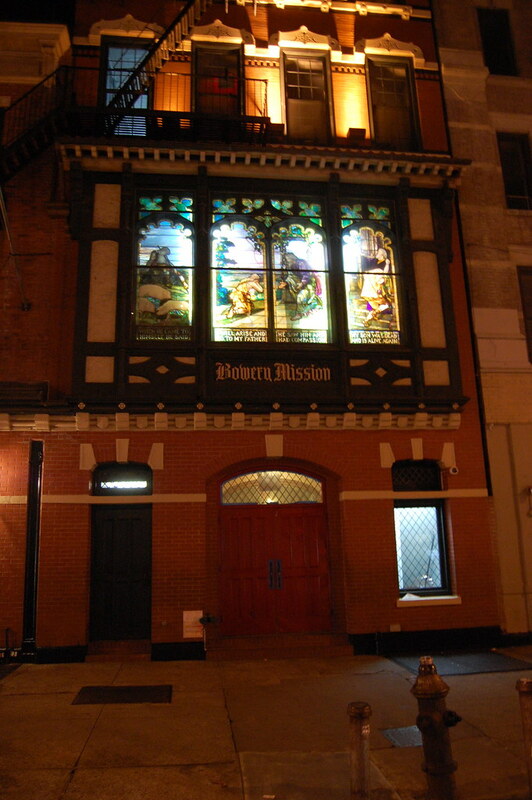 Jacqueline Humphries at 153 Bowery, inches from Broome Street. The Kool-Aid man emerges: artists at work on Richard Prince's mural at 265 Bowery. 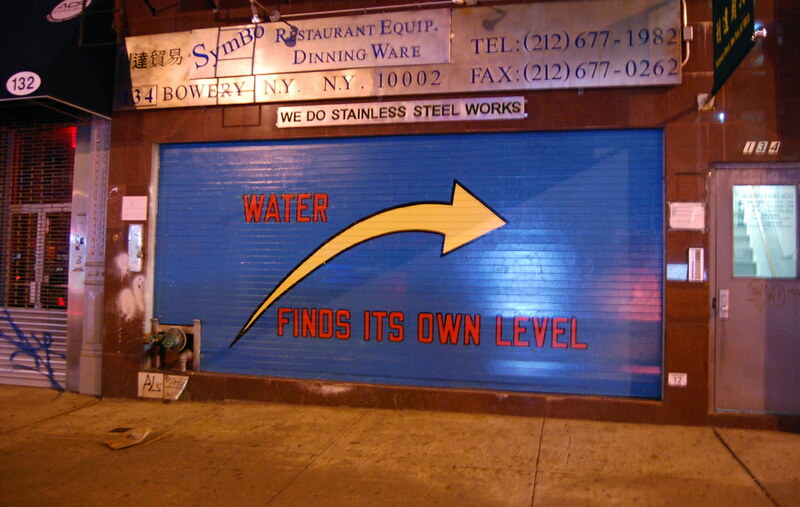 In other cases, the translation from contemporary painting to street mural is more awkward, as in Richard Prince's enormous Kool-Aid Man or Lawrence Weiner's gorgeous blue text piece. They're both stunning, particularly the Weiner, but they feel slightly out of place along the Bowery. This refusal of site specificity and the unique context and history of the street is a missed opportunity: these murals could be anywhere. 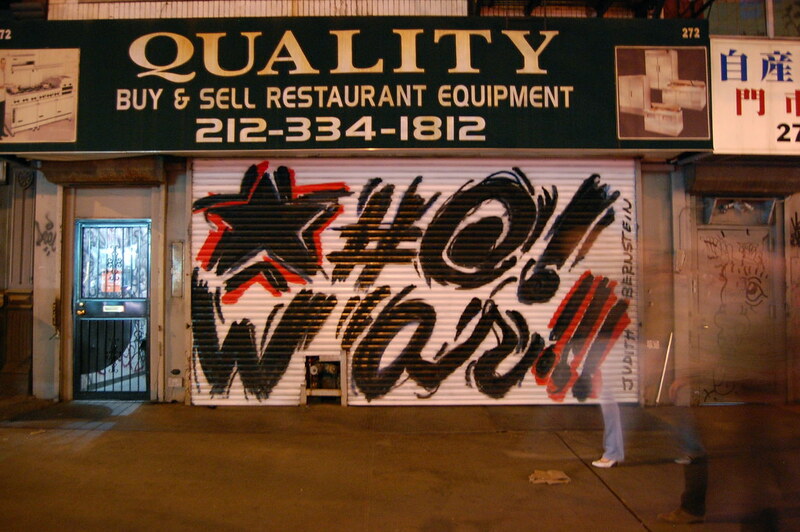 That can't be said of Rirkrit Tiravanija's piece, with its awkwardly shaped letters and occasional patches of sloppy painting, recalling the hand-painted "no parking" signs that adorn the storefront gates of many businesses around the city. 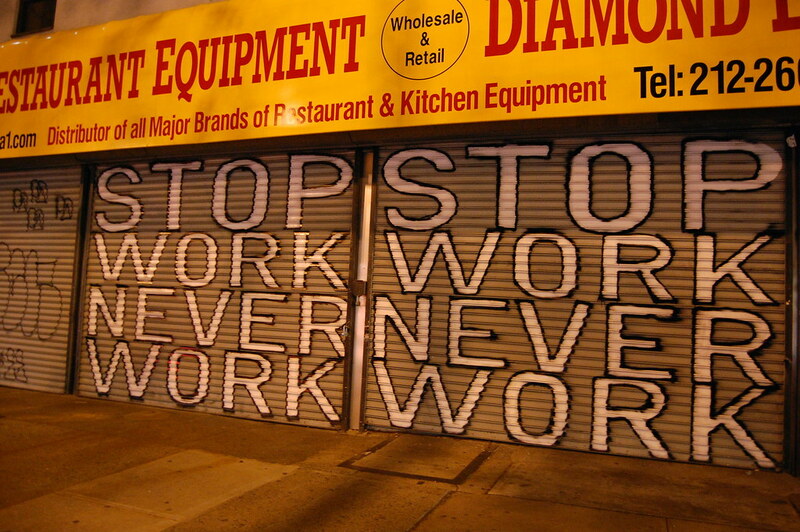 It reads, "STOP WORK / NEVER WORK," a slogan plucked from the graffiti of Paris's 1968 revolts ("ne travaillez jamais") and sometimes attributed to Situationist International founder Guy Debord. That phrase also happens to be the text I had printed on the Tiravanija T-shirt that I picked up recently at the artist's "FEAR EATS THE SOUL" show at Gavin Brown's enterprise. Painted on the Bowery, on gates just a few blocks away from the Bowery Mission homeless shelter, it becomes far less easy to consume. 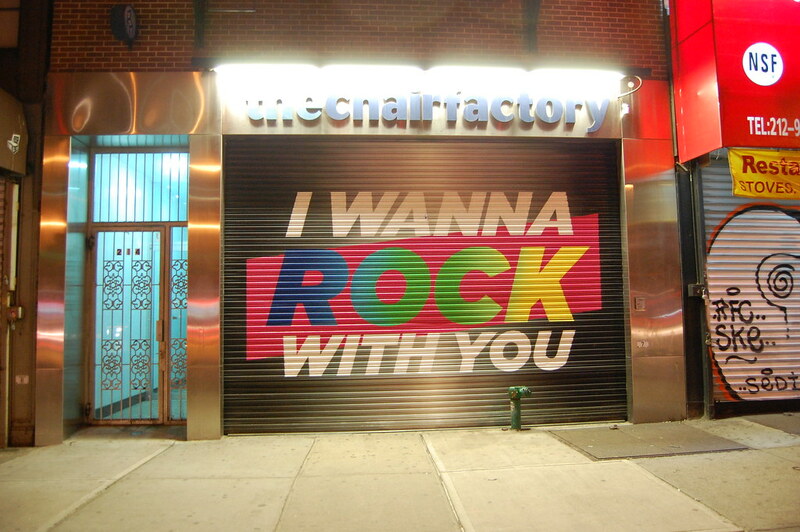 214 Bowery: Deborah Kass and Pulp, Ink have painted the gate of The Chair Factory.